I used almost equal amount of each. Some florets of Broccoli, Few springs of cilantro , Few celery stalks, few spinach leaves slipped in boiling hot water with salt. Also added 4 pods of garlic and half an onion and an inch of ginger. When they boiled enough, switch off and blend to purée. Garnish with dry herbs and pepper. Drizzle a spoon of olive oil that gives a good glaze..Serve hot. Soups are always warm and comforting. Nice healthy soup. I am soup lover.. i can have soup anytime.. really this is looking so healthy and comfort. 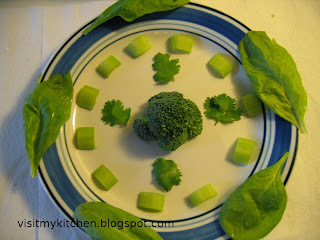 Loaded with fiber and iron..
First time here..Nice blog..u hv a nice collection of recipes.. Thanks for visiting my blog Soumya..lot to explore here..I am not a fan of soup but liked ur soup becoz of my fav brocoli..i am a big fan of brocoli.. 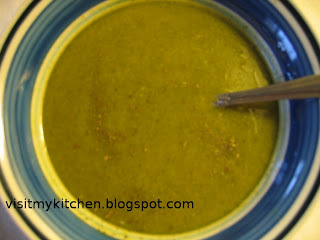 I like this soup :-) great with some toast. Hey Sowmya, What a presentation!!! I really like it.and collection of recipes are nice too... lovely soup..and the color too,I will try it once day...sure.